If you’re interested in becoming a puppy raiser, visit the GEB Volunteer Center. IFT stands for in-for-training. The IFT is the final test the dogs take to determine if they’re well suited for a career as a guide dog. 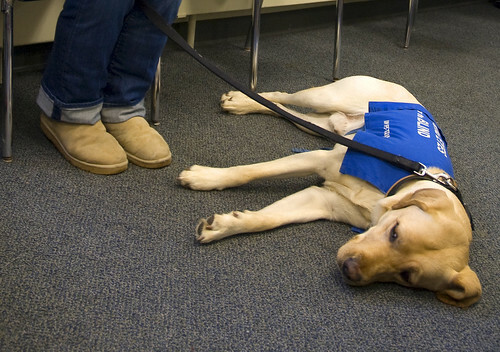 The dogs are handled by Guiding Eyes staff. Together they do a series of commands such as sit and down. After that they do the gun test and the umbrella test. The gun test examines how the dogs respond to a loud noise and the umbrella test determines how well they respond to sudden visual stimuli. Trainers also test how quickly the dogs forgive the person who opened the umbrella so close to their faces. Ithaca College strongly encourages all students to become involved in community service. The College's Office of Student Engagement and Multicultural Affairs acts as a clearinghouse for volunteer opportunities on campus and throughout the community. I had always loved dogs, but I thought I’d never be able to have one as a college student. 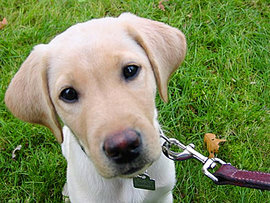 So when I heard about the Guiding Eyes for the Blind (GEB) program my sophomore year, I was eager to get involved. I did a little research, got in touch with the area coordinator, and applied to be a certified puppy raiser. Before getting a puppy, I attended a pre-placement class where we received an overview of the program, including the general amount of time the puppies are with a puppy raiser (anywhere from 12 to 16 months) and the basic commands we would need to teach our dogs. The best part of the whole day was when we were able to work with real puppies in training! After some “puppy sitting” and a successful trial run, I got Rusty. At eight weeks of age and just 12 pounds, he was already showing his eccentric personality. He couldn’t sit still the whole car ride home. In fact, he hasn’t really sat still since. Soon Rusty and I were off to puppy class where all of the guiding eye dogs from our region came together to practice. Each week we learned new skills and were evaluated on our training techniques. We worked on such things as basic obedience, loose lead walking, and impulse control. Then we were sent home to reinforce these new skills with our dogs. Rusty needed a lot of help with his impulse control. He always sniffed the ground when we would walk, so we practiced using sniffing as a reward for good behavior. Throughout the training process we had constant guidance and support from the program’s coordinators. Raising a puppy while living on campus was no easy feat. Rusty would wake up at the crack of dawn ready to start his day. I gradually adjusted, and once Rusty got older and learned to mind his manners, he was able to go to all of my classes with me. Having Rusty made my life somewhat different from that of a typical college student. Before I could do anything, I had to think about Rusty, his schedule, and his needs. Sometimes I was envious of my friends who lived a more carefree lifestyle. They came and went as they pleased, slept whenever they wanted, left clothing and shoes on the floors of their rooms. On those occasions, however, I would look at Rusty and remember that I was helping to make a difference in the life of a blind person. Now don’t get me wrong: having Rusty wasn’t a completely selfless act. He did a lot for me as well. He was my constant companion. If I had a particularly rough day, he could sense it, and he was always there to cheer me up. When I went running he was right there next to me -- my own personal cheerleader. On days when college life got a little too serious, his carefree, playful attitude reminded me to lighten up and go with the flow. I remained composed during most of our drive to his new home at a professional training facility in Yorktown Heights, but when I took him inside, I lost it. I stayed for a while, trying to savor every last moment with him. Leaving Rusty behind was the hardest thing I’ve ever had to do. Rusty passed his final dog training test and is now training to be a guide dog. My life at IC is much quieter, cleaner, and a little sadder. I am extremely proud of Rusty and how far he has come. His boundless energy once earned him time-outs during puppy play time, and now he is becoming a seeing eye dog. Nothing can replace the things that Rusty taught me. He taught me how to be more responsible. I had to put him before anything. If he needed to go out or needed to eat dinner, it came before my needs. He helped me become more patient. He forced me to stay calm and focused to continue with his training. Nothing can ever fill the void that I now feel inside. What he doesn’t know is that I am already so proud. Hi! This is such a great thing that you did. It is even more special because you did it in college! I also raise guide dog puppies, and came across your story while looking for a college to attend. I am so curious as to what it was like raising one on a college campus, and how the college allowed you to do it. I am so interested in doing this in college. I am a senior in highschool looking for somewhere to go. I hope Rusty makes it! It really is the best feeling in the world when they graduate. I work in the kennel where I raised my puppy (Dave!). Looking foward to hearing from you! I am trying to get my guide dog raising program off the ground at my university and I am catching some bumps in the road. I am really looking to get in contact with someone who could answer my questions and help me. Could you help? Please feel free to email if you can.